Many Charlotte area customers struggle with a wet musty crawl space and ask if we can solve their crawl space problem. The answer is Yes! In most cases we can permanently solve the water intrusion problem with a vapor barrier, french drain and pump system. Call today for a free crawl space inspection! Crawl space repair will help you avoid unnecessary repairs, create a healthier living space, and save money on your utility bills. And once you’ve encapsulated your crawl space with a vapor barrier, you’ve gained valuable storage space in your home. All-size solutions. 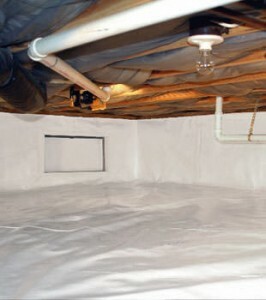 The Crawl Space Encapsulation System can provide moisture control for any size crawl space.